In 2010, I won the pitch to repackage Alexander McCall Smith’s series, The No.1 Ladies’ Detective Agency. Under the watchful eye of Duncan Spilling, Creative Director at Little, Brown UK, I’m still doing it five years later and it’s been central to my portfolio and my confidence as a Designer. This week I met him at a reading in my home town of Frome, and I realised the most basic of things – meeting your author can complete the circle. By that, I mean it can remind you why it is you do what you do. I’m a designer because I’m creative and I enjoy it, books suit me and I love to read. But more importantly, I do it for an author and their readers. 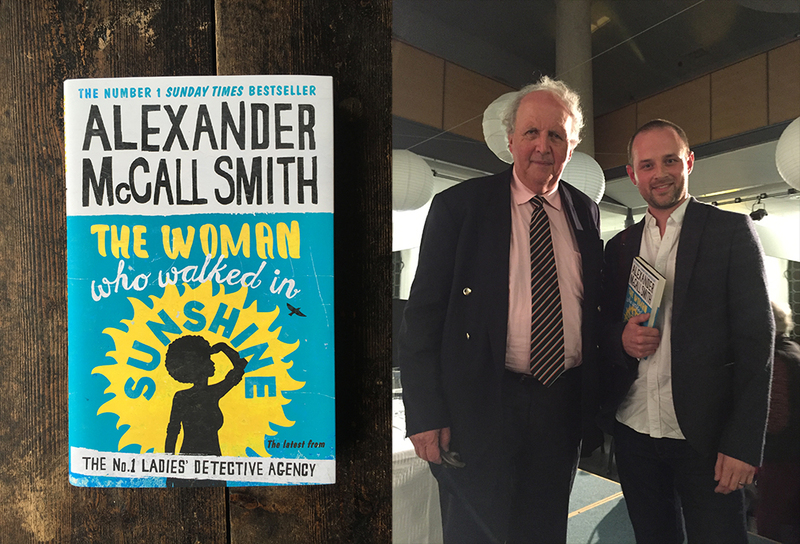 At the event, which was a Q&A session with Mr McCall Smith (I feel I should address him as such, the learned fellow that he is), I was lucky enough to have a few moments with the man himself before he went on stage. We discussed his covers, and he was as gracious and complimentary as he has been with every one of the eighteen books we’ve done together. At the end of the event, I took the chance to thank him from the audience, but he beat me to it. Introducing me to the crowd, thanking me for my work, they all clapped. Wow. With a signed copy in hand and a few pictures of me and Alexander (I feel I can address him as such, now that we’re mates), some audience members stopped me to say how much they liked my designs. We discussed the inspiration behind the cover look, how it developed over the series. It made the spring in my step as I left the event even springier. At the other end of the scale, I recently took on a new self-publisher’s brief which wasn’t the norm, in that the author had assembled an industry-standard set of professionals to package, print and market their book. You’ve no doubt heard of this before, especially with the advent of platforms like Reedsy and Pronoun, but this time I went beyond my remit as Designer, and got involved with helping the author feel confident in making the right decisions for their book, listening to their questions, however basic, and generally being there for them. These two recent examples reminded me not to just design, but to engage with the people that you’re working with. They might just be a future Alexander McCall Smith. Sincere thanks to Jan Rutherford (UK Publicist for Alexander McCall Smith), Duncan Spilling (Creative Director at Little, Brown) and Hunting Raven Books, Frome, who organised the event at Rook Lane Arts on 5th October 2015.